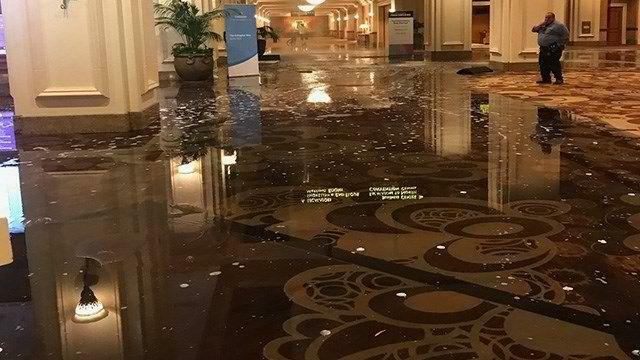 A water main broke in a loading dock area in Mandalay Bay, Las Vegas on Tuesday afternoon flooding the convention center floor. Clark County firefighters had to be called to the scene to assist. The leak was reported at 4:33 p.m. The fire department promptly sent six engines, one truck, two rescues, the heavy rescue and two battalion chiefs. People reported to the responding firefighters that water was leaking from the area between the first and second floor of the convention center. It was also reported that water poured onto the first floor of the said convention center. Scott Zamost had a series of tweets and updates on what’s happening in the area during the flooding at the posh area. The Clark County Fire Department (CCFD) said they were able to turn off the water. The firefighters were able to relocate around 1,000 people on the second floor to other areas of the hotel as a precautionary measure. There was also no report of structural damage to the building. Hotel staff started removing water from the flooded convention center. The CCFD also gave assurances that water and electrical power was “secured” in the area. Even after ensuring the situation is under control and everyone’s out of any danger, the responding CCFD personnel stayed behind to further assist the hotel staff fix things back to normal. “A water leak at Mandalay Bay has affected a portion of the South Convention Center. Crews are working to clean up the leak as soon as possible. There are no injuries or major disruptions to operations." A spokesperson for Mandalay Bay also said that the activities at the Convention Center the following day will proceed with its normal events and operations schedule on Wednesday morning.